There has been a big uptake in Canvas usage across the state. Part of the reason for this meeting is to discuss this usage. Wow. Photo op with the Panda. Their goal - When districts roll out Canvas they spend a lot of time working to make sure faculty members are ready. She was a school psychologist in an elementary school. She has been with Canvas since Instructure Con 2012. She is working on a new product involving data. Update on analytics so teachers can track the data coming out of the end. She is in alpha stage with the project. She wants to know who is using the courses and for what purpose are they using them. How many courses are using pages, modules as opposed to students engaging with assignments, discussions, quizzes. Does it make a difference in student performance to use discussions, assignments and quizzes? They are also hoping to compare institutions. They want to see how many teachers are actively engaged in Canvas. What if UEN had a database for all the students and teachers in Utah? We could see where help is needed so we can scaffold our teachers. Canvas has a truckload of data. What if we could see how long students are engaged and interacting with Canvas? What decisions can we influence? We could look at the efficacy of our questions on our end of level tests. Corey - Nebo - We want to know if kids are using Canvas at home rather than at school to decide about devices. Parents have to be added as an observer. Problematic. (Utah Connect teacher) Are students just logged in sitting there or are they actually working? - how long are students actually engaged? Why are they failing? Time on task per student. Are they paced appropriately. Lots of digging to find parent and guidance counselor contacts? Rachel M. - Better progress report needed. Counselors want to know if students are on track for graduation. Sevier School District - Students from reservations - 1 counselor is observer for 100 students. They want to be able to retrieve the information more quickly and easily. Hillary queries - Would it be beneficial to anyone to see student outcome progress outside of the course across multiple classes to determine how much progress has the kid made in science as a result of geometry class. Jordan Dist- Mastery Connect to get evidence of student improvement to indicate teacher growth and effectiveness. The teachers are being held accountable for this right now. Students have to show 30% growth. Sage testing only works for 3 core subjects. Corey Nebo - grading scale 1 - 4 then translated for SIS grades which is a pain. Davis - John Hyat - The emphasis is on PLC's - that's where they need the data and can make decisions. They don't have all their high schools on Canvas. Corey Nebo - teachers will not readily accept common tests throughout the district. Harrison Becket and Jay Eads spoke - Some districts are mandating benchmark tests. Teachers often resist being told to do what, when and how. SB64 - requires part of teacher evaluation being based on data. Canvas has a small footprint in Jordan. Hillary wants to come to schools and talk to teachers EduGossip - You can email her Hilary@instructure.com @hilaryscharton - she lives by Mindy Hintze. ~ 15 people using the new user interface. Teachers are saying it is cleaner, easier to use. The toggle feature is obscured to some teachers. Robert Gordan - Student complained about old UI, Robert showed student the beta, Student was really positive about new UI. Justine Brooksby has had no negative feeback. New technology is a very responsive design. Canvas has the highest rated LMS app right now. Data says most students are logging onto Canvas with a MD. It works well over all landscapes. Turn new userface on - Right now is an option but it WILL be the new UI by fall 2016. Student can customize course titles. Toggle on and off activity feed. Can you put a picture in the block rather than just a color. Next release of UI should have this ability. Teacher will set a course icon. Rachel M. Mobile App - doesn't show what the student did incorrectly on the quiz. Students can see what they missed but not on the app. These things not available for free for teachers. - Canvas changes every 3 weeks or so - they usually release things in beta first. 1. Differentiated Learning - for unique learning styles and preferences. Ability to individually assign to one person privately. Order functionality in modules. Prerequisites and requirements can be implemented. Function is constantly evolving. Pages, documents, quizzes - iterative approach - Scott encourages everyone to share their state-aligned content. 3. SIS integration - This is their focus to share everyone a lot of time. They have work to do on Aspire. Skyward integration in beta. Powerschool is in play. Sam Thompson - Park City loves the integration that they are using with Powerschool although Powerschool is having its own issues (grade passback is live). Clint Stephens - Millard is currently syncing but now they can grade passback. Repeated events every month or every week. Multiple grading periods has bugs. Requests - if Canvas gets 100 votes they will look into it - Agile Design. Outcomes - Jared Fawson - What do I want my students to be able to do? Outcomes in Canvas tracks. Teachers can create their own outcomes for their classes but admins. can put the state core on there for the teachers. You can take the most relevant score. Clint S. - Where do outcomes come into building the course? Come up with the outcomes then build the rest of the course. You can use the state core or SLOs. Rubrics & Speedgrader - Dani - built a rubric for feedback on a specific grade book outcome. Laura Hunter - said Some of the CTE teachers are using the video feature to record performance tests. Some instructors are recording their own feedback to students. Learning Mastery Gradebook - Jared Ward - solutions engineer - gets to do trainings for people who are evaluating Canvas - Works in Texas, Utah and other states. Outcomes can be created at individual teacher level or at admin level. Teachers can find district level rubrics and outcomes. Then the district can access the data district-wide. Canvas builds graphs for whole class or individual students. Students and parents can see similar views and graphs. Students can put if what if scores. (How high do I have to score to pass your class?) Students and parents and teachers can track progress over time. Canvas speed grader app is a great way for teachers to give recorded feedback. Magic Marker in speed grader app. As we get started with Learning Master Program - get help from Customer Service Manager or UEN to set up the points system to determine who met the standards. UEN uses highest scores generally but that probably wouldn't work for high school. https://guides.instructure.com/m/22289/l/237853-what-is-the-magicmarker-app Jared will send a step by step tutorial for setting up outcomes soon. Module Management - Michael H. - If you embed a Google Slide show, and the course gets copied, if you update the Google Slide show, it will upgrade in all the copies. (Bicycle cog and ice cube tray.) "Modules are the course skeleton." - Michael H. Does the prerequisite automatically change because the sequence changed? No! Easier to import and export modules. Canvas Admin - Jared Ward - Admin panel - Help somebody fix something - Monthly CSD files can be available for data warehouse. Talk to CSM. District wide access - sub accounts could be schools, departments, classes. A tiered set-up. Global announcements can be made. Canvas accounts include those for observers, designers, TAs. They have Google single sign on (Google Apps for Education) Admins can have a beta space where they can play with new releases and if it breaks, they will have a reset every week. You can embed a Google Doc slide show in both the old and new UI. Install apps - teachers can do it as well. Like CanvaApps. Badges - Jared Ward - Badger - Open Badges Community - Badges can be tied to Outcomes, etc. If a student could earn a badge in your course and put it on their Linked In page - what would it be. What value would it have for them or for getting a job, etc. Task force had to look at teaching and learning and come up with a plan to present to the legislature who swears the Senate and House will work together. Jim Langston, Tooele, also on the task force. Task force contracted with Common Sense Education and Cheryl Limke, & Connected Nation. Version 1.0 will be presented to the legislative interim committee next Friday, 10/7. Essential Elements for Technology Powered Education. Anybody can get the grant even if they have won before. 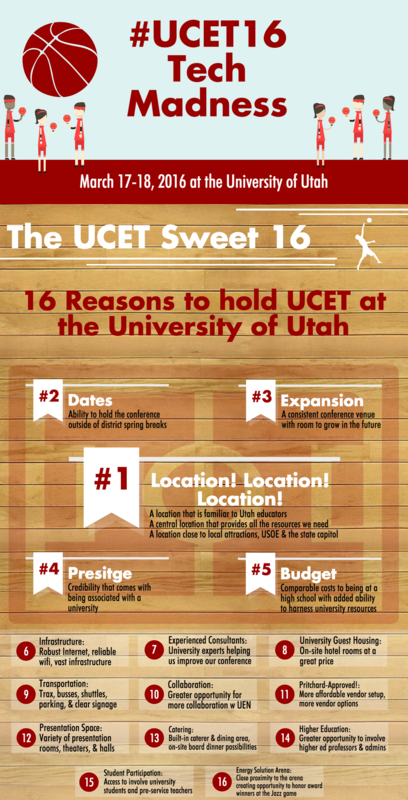 UCET Updates - The Jazz players are coming to UCET next year! Not! Theme for March 2016 UCET is TECH MADNESS - Infographic shows below. HANDS ON GET UP AND MOVE UCET. Get up, moving and excited at the Playground/Maker Space at UCET. They have a new executive director, Larry Jeppson, who was a very good executive director years ago when he did it. Justin Brooksby - UEN is happy to share their courses and their Canvas paid licenses. UEN is trying to get Canvas courses out to districts and provide resources. !People are getting excited for SueCon - November 6 & 7 2015 ! 1:00 - 2:00 Adoption/Roll Out Strategies - Mindy Hintze, Product Engagement - Mindy has been with Canvas for 11 months. She has held 4 positions. What are some things we should think about? During the roll out process is where the naysayers are going to be strongest because it isn't as smooth as they wanted. You need to have a clear vision- Why are we using Canvas? What do you want your students', teachers' and parents' experience to be. It is not about the technology. It's about the learning experience. We want learning experiences in Canvas to be awesome. What happens when Canvas is optional? - People in Valley of Despair opt out. Help teachers - pave the way for them, scaffold them, set of expectations or templates for the web page. How are you going to share this information with your stakeholder? Parents, Teachers, Boards, etc. _-Every teacher should have a web page might be a requirement. This class is about having teachers engaged in and doing Canvas rather than be lectured to. We can copy and use the course or parts of it as we wish. UEN - created a course for Cforum - They had a nest of differing Canvas courses - 2 day, 1 day and 2 hour. So they brought them together in this course. Canvas presenter - Canvassador - not as formal as a certification - available in Jan or Feb open application - More information will be posted on Ut. K12 Group page. There is a possibility of a Canvas Certification as well. Is lane change credit available - Contact Justin Brooksby - They will even process the credit for you. They will have to do the registrations. Then we will teach the course. The Outcomes are in the class - They want to have a badge for every module. We want continuity. They want the Canva Badges to have the same value across courses. They want to reboot the courses summer, spring. They may put this class into Commons but it isn't quite ready yet. We can export it and put it in our own instance of Canvas. Teachers are having some problems with breaking classes that they import because they change things. That is a training issue. Microsoft Office 365 Integration works well - The ability to submit student assignment is very easy, even easier than Google Docs. If we have problems with 3rd party providers - McGraw Hill, Pearson, Roseta Stone, actually listen more to us than to Instructure. LTI's - Zaption - will update in existing courses. John Hyat talking about Rachel Murphy's Black Diamond stuff (Incentives for recognizing hard work). They like having a checklist of competencies. Their Black Diamond stuff is similar to the one in the new UEN course. Michele.Xi@Canyonsdistrict. Their incentives include software, then headphones, swivels for recording, items of more value. It's about the level of implementation of blended learning. Canvas Black Diamond Challenge on Canvas YouTube channel We don't want to belittle the efforts of someone just getting started. Celebrate small victories. Rick says the Legislature doesn’t think that districts can do large scale deployments. USOE is helping sponsor CoSyn certification. Logan guy (Dave) says policy from Washington is pushing on this particular certification. He says Utah is ahead because we already have 11 certified and more just took a test. Probably 8 more passed the test yesterday. The push for this certification is coming from the East Coast. Kelly Dumont will be leading the next cohort. Senate bill 42 was substituted for SB22 which did not pass. UEN is part of the task force chaired by Dave Thomas, Laura Belnap, Mark Openshaw, (he was killed in a Plane crash) so Stan Lockhart substituted. Terry Shumacher, Ben Dalton, Brian Boles from Davis UETN Board Member Jim Langston reps Tech Directors Sen Howard Stevenson Rep. John Notwell Fred Donaldson, Nolan Karis rep Excellence in Education They have met 14 times since middle of June. USOE received 1 mil for task force UTEM received 4 million to figure out what schools need. They wanted a consultant to help write the master plan. Common Sense Education was selected. Led by Jeff Mau and Steve. They have been leaders in master plans in Maine. An important part of the initiative plan is good communication. Skye – Walden University – phd program Hyper Cycle Logan guy (Dave)feels like he is on the campaign trail trying to get the community educated about the 1 – 1 deployment of the initiative. Some people in Logan are very resistant. Leadership has promised to collaborate on this - $70 Mil ongoing supposedly, LDA ? Even if the bill passes, (some people with the initials LH for one, are hopeful), they don’t anticipate this being rolled out till fall of 2017. Policy makers have trouble understanding how much background work is involved. What we work on today and Rick et. Al work on this weekend will be presented next week. Sounds like there will be 3 versions by the time they get in front of Executive Appropriations in November. Then they work with legislators prior to the Legislative session in Jan. The bill needs to be ready by the first of December. They want to implement via rule instead of via legislation. The bill should only be about 4 or 5 pages long. You can change the rules but you can’t change legislation. Once you have located a parking spot on level 3 of the parking garage walk North towards the skybridge to access the building (6330). Once inside, walk right down the hallway to the elevators. Take the elevator to the 6th Floor. Exit elevator to your right, the meeting will be located through the door at the end of the hallway.